The new Shortcut app in action. Not sure why you would order a second pizza if you’ve already got one waiting to be eaten, but the this app looks pretty awesome. Homeowners with a serious smart-thing addiction are going to love Shortcut! This freshly launched app aims to unite all your wi-fi and web-connected devices in one handy, voice-controlled app. 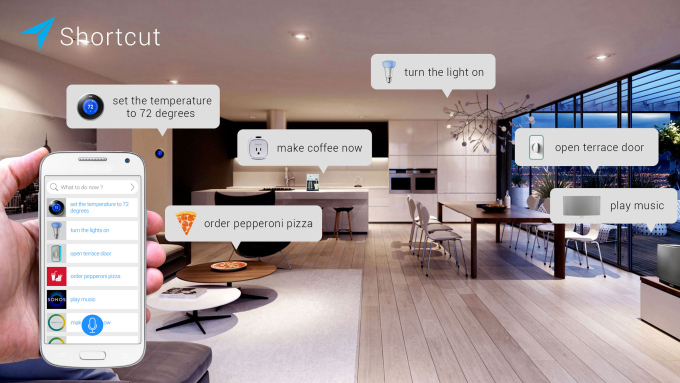 Shortcut co-founder Duy Huynh likens it to “a Siri for the Internet of Things”, and that’s exactly what this central command hub is all about. Using a phone as a remote control for various devices around the home is nothing new. But, as the Internet of Things fills up with, well, more things, the price of entry is an ever-increasing array of standalone apps for controlling these things. No one’s looking forward to the day when your dishwasher, your refrigerator, your garage door, your smoke alarm, your doorbell, and your thermostat all demand their own exclusive apps. It’s TV remotes all over again! Enter Shortcut. One interface for all of your devices (including a few surprises). Fitbit: Watching your calorie intake? Speak to log your breakfast in Fitbit‘s meal tracker. Belkin WeMo switches: Turn on the crock pot or turn off the fan you left running through your Shortcut with a WeMo switch. Phillips Hue: Switch to mood lighting without leaving the couch. Looking forward, Shortcut is working on at least two smart watch deals and adding compatibility with more devices, including Unikey, Ecobee thermostats (read our Ecobee review here), Jawbone, and Sonos speaker systems, and others. Shortcut is currently working on a $1.5 million round of funding to support its expansion. We here at Smart Thermostat Guide are pretty darn excited about Shortcut. It’s not available on iOS yet (boo hiss) but the developer promises that iPhone / iPad apps are coming soon. If your home is filling up with “smart things”, keep an eye on Shortcut! You can download Shortcut from Google Play right here.